Most watch fans know the story: LeCoultre introduced the Reverso in 1931 as a sports watch, with the unique “reversing” feature designed to protect the crystal for polo players. But the story wasn’t quite so pat: LeCoultre outsourced design to Jaeger (then a separate business), didn’t have an appropriate movement, and the flip-over design wasn’t even unique. Production stopped after just a few years, the sports watch market moved on, and the Reverso was largely forgotten. In the 1970’s, it was Jaeger-LeCoultre’s Italian distributor who restarted production (allegedly unauthorized), and it wasn’t until 1982 that Jaeger-LeCoultre would introduce a new-generation Reverso. By now, the Reverso was seen more as a dress model, positioning that Jaeger-LeCoultre’s later Reverso Squadra and others could not reverse. By the 2010’s, the Jaeger-LeCoultre Reverso was firmly reestablished but as a classic piece for watch lovers than as a mass-market sports line. In 1994, Jaeger-LeCoultre introduced a new twist on the classic Reverso. Rather than a blank steel plate on the reverse, the Reverso Duoface had a second watch dial driven by the same movement. Driving two faces was a serious technical achievement and showed off the many capabilities of Jaeger-LeCoultre: Their in-house movement design, wide variety of movement variations, and top-tier manufacturing capabilities. 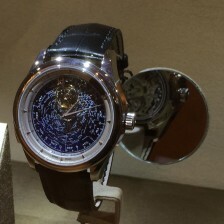 It also became a useful complication, allowing each face to display a different timezone. I purchased my Reverso Duo (as the American model is called) at the end of 2013, selecting the model for its technical credibility as well as its aesthetic design. My Duo is the updated model with a large square pushbutton that advances the hour hand on the darker side 1. My Reverso Duo still uses a classic hand winding movement, Cal. 854/1. This hasn’t been as reliable as I hoped: It stopped running after just four months so I had to return it to Jaeger-LeCoultre for service. Although it has been reliable ever since, this was a disappointing experience for a first-time high-end watch buyer. The GMT pushbutton operates smoothly and quickly, though it’s somewhat unfortunate that it requires 24 total presses for every trip. The tiny crown operates smoothly (though it’s sometimes a little tricky to pull) and the flip-up design really helps when winding the watch. The “light” side features a classic design with small seconds at 6:00 and lovely guilloche. The “dark” side substitutes a 24 hour dial at 6:00 along with hour and minute hands. This is where the “away” or GMT time is shown. There is lume on the dark side hands as well, but they’re so small as to make it mostly useless in the dark. The inside of the case is machine turned as well, with a lovely pattern. The Reverso is extremely comfortable on the wrist, being incredibly compact. The lugs are actually an extension of the outer case, though newer models feature tapered lugs. The strap is narrow but thick and feels on the wrist like an extension of the case. The butterfly-style deployant clasp similarly disappears into the strap. Overall, the Reverso wears more like a bracelet than a watch. Although a classic and elegant design, I find that the Reverso doesn’t draw attention to itself. I think that the square look of the Apple Watch further anonymizes the Reverso. It’s much smaller but still a similar theme. This all changes when people spot me flipping the face over: It’s such a unique feature that even watch newbies ask what it is I am doing. They all love the home face/away face design. I really enjoy my Jaeger-LeCoultre Reverso Duo, wearing it frequently and enjoying the design, comfort, and functionality of this classic piece. when they stop produce this watch? because one of the shop they selling it with 2018 dated year , but i thought the already stop produce?